Are you interested in working for federal government? Do you want to know what opportunities are available, or what resources are out there to support your interest in pursuing your federal career? Take a look at the resources below. Go Government: An online resource for exploring and pursuing federal employment that includes insights on the federal hiring process and career guides based on professional area and interest. USAJOBS:The Federal Government’s official employment site for opportunities with 500+ agencies across the United States and around the world. USAJOBS Events: A list of upcoming virtual events led by the Office of Personnel Management and other agencies, aimed to provide guidance around searching and applying for federal opportunities, including for individuals with disabilities, such as federal resume writing, interviewing, and navigating USAJOBS. See additional resources in Career Connect. 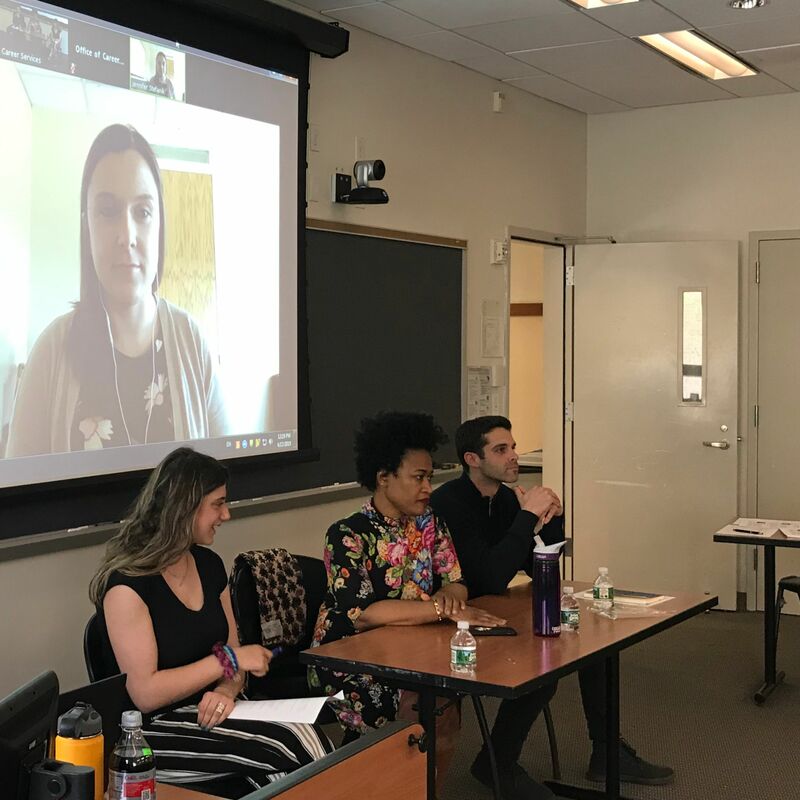 Last Wednesday, April 17, we had the pleasure of welcoming back Ari Borinsky ’17, Psychotherapist at Insight Psychiatry & Psychotherapy, Jennifer Stefanik ’18, DBT Therapist at the Koch Center, and Tonia Spence ’02, Senior Director of Early Childhood Services at the Jewish Board, to share their unique experiences, insights, and advice on obtaining clinical licensure as social workers. The panel discussion, which was moderated by Mental Health Caucus Leader Ashley Leeds ’20, highlighted the importance of proactively inquiring about clinical hours and supervision during the job search process, confiding in peers for additional supervision, consultation, and support, and taking advantage of panels and workshops led by professionals in the field to further develop relevant knowledge and skills. Also addressed was the process of managing expectations, including having a realistic understanding of what early career clinicians should know or be able to do in their first jobs or in specific organizations, as well as the uncertainty and anxiety that comes from starting anew as clinical social workers. The Office of Career Services and Leadership Management and Mental Health Caucus would like to extend our sincere gratitude to our panelists and attendees for creating an informative event for all! Do you want to build your marketable skills? If you would like to enroll, please complete this form. What will you learn in the Institute on Technical Skills for Online Event Production? This institute is for CSSW alumni who are interested in learning what goes on behind the scenes to manage the technology of online events, including online classes. In the course, participants will learn how to prepare for live online events, how to run the technology for live online events, how to write reports sharing data on live online events, and how to provide technical support to anyone experiencing technical issues. They will also learn how to edit pages in the Canvas learning management system. This institute combines asynchronous homework online, as well as three live 2-hour webinar sessions in Adobe Connect where you gain hands-on practice as you learn. The professional skills that participants develop in the institute may be relevant to professional roles conducting virtual training, running live online events, creating digital content, and more. In addition to developing these skills, successful completion of the institute may qualify participants to apply for part time positions with the Online Campus as Live Support Specialists. Participants who successfully complete the institute will receive a letter certifying completion of the course, a digital badge to share their accomplishment on online platforms, and they can add their participation and skills to their resumes. There is no fee for the course, but students must provide their own computers, webcams, headsets, and hard-wired Internet connections. If you have questions about the technical requirements, please feel free to email info.csswtechinstitute@gmail.com. Please note, applications for the Live Support Specialist role are by invitation only (invitations sent after the institute) and successful completion of the institute doesn’t guarantee an invitation to apply. Whether you are interested in applying for a position with CSSW’s online campus, or you’re just looking to learn a new skill set, you are welcome to attend! When I graduated from Washington University in St. Louis with a Bachelors in Psychology, I was still unsure what I wanted to do. I decided to participate in an AmeriCorps program, The Choice Program, serving youth with justice-system involvement in Baltimore. This experience was tough, but incredible, because it showed me all the skills I lacked to do the type of work I wanted to do with the kids there. I decided that pursuing an MSW at Columbia would be the best path for me to gain those skills. I currently work for the Mount Sinai Health System as a Program Coordinator in the Care Management Program. Care Management employs social workers, care coordinators, nurse clinical coordinators, and others to carry out the population health goals of the health system. As Program Coordinator, I provide clinical supervision for the social workers and care coordinators providing direct services to patients. This is an aspect of my work that I love most, because it allows me to stay connected to the direct work, flex my clinical muscles, and support my supervisees’ professional development and growth, which is always inspiring. I also plan and develop workflows and initiatives to better engage patients in meaningful care. For example, Mount Sinai has recently partnered with a new insurance provider serving those with Medicare and Medicaid. In this initiative, I create reports, present data to health system and insurance administrators, and work closely with the insurer to meet standards set forth by the Center for Medicare and Medicaid Services, while setting up best practices to facilitate the most efficient and patient-centered interventions. I love being able to effect change in healthcare through this work. My goal is to use the lessons learned working in a large health system to make broader changes in healthcare, especially seeing the systemic constraints placed on hospitals and patients that exacerbate healthcare disparities. 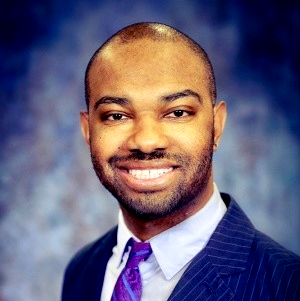 I recently published an article on the subject of these disparities in the International Journal of Aging and Society (now known as the International Journal of Aging and Social Change), titled “Seeing Healthcare through a Social Work Lens: Tackling Disparities and Inequalities for the Elder African American Male”. * I have also had the opportunity present at conferences around the world and look forward to continuing to advocate for improved access to healthcare, quality of care, and health outcomes, particularly among underserved populations. How did your experience at Columbia impact your career trajectory? My time at Columbia prepared me for much of my journey at Mount Sinai. In addition to developing critical clinical skills as an intern at IMPACCT Brooklyn (formerly Pratt Area Community Council) and Memorial Sloan Kettering Cancer Center, I was involved with many of the caucuses and that allowed me to interact with people with varying experiences and points-of-view, often times different from my own. I have reflected on those experiences to develop better relationships with my supervisees, colleagues, and leadership. This also prepared me to take on more leadership roles. I also worked on a research team with a post-doc focused on juvenile justice and planning. Working with her rekindled an interest in writing and caused me to be more thoughtful about the problems beyond my day-to-day work. Though I’m not completely sure what is next in my future, the curriculum and wide range of concentrations and fields of practice showed me the vast array of opportunities I can pursue as a social worker. What knowledge, skills, and abilities have been critical for success in your roles? Flexibility is the first trait that comes to mind in terms of being successful in the health system, as protocols and workflows may frequently change to meet the needs of the larger health system. 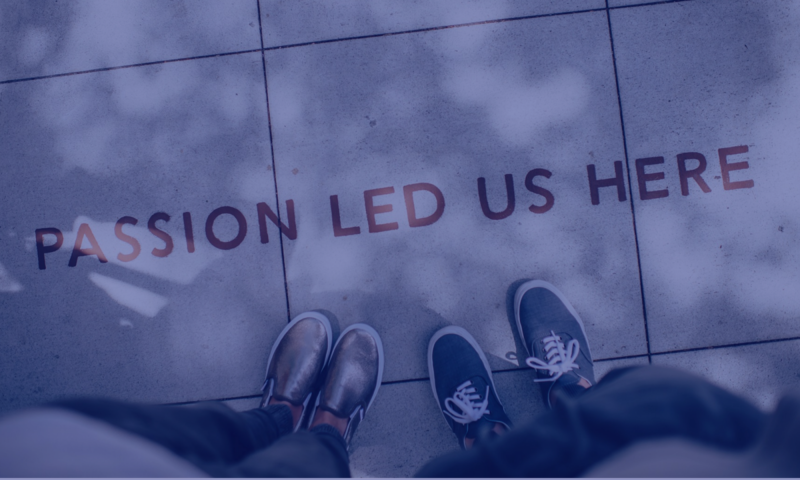 Being willing to take risks and volunteer for new pilots and initiatives — understanding you will have to build some of the structure as you are doing the work — is what leads to new opportunities for success and growth. In general, you must have a wealth of empathy and be able to use your clinical skills in creative ways. What advice do you have for students and fellow alumni? Take advantage of your opportunities when they come, understanding that there will be times where you feel like you aren’t ready or prepared for the moment. It might be uncomfortable, but you can always grow from these experiences. *This article received the International Award for Excellence for Volume 7 of the journal. Take advantage of this special opportunity to meet and greet agencies at the upcoming Tristate Master’s Level Social Work Job and Networking Fair taking place at Fordham University’s Westchester Campus. This event is open to alumni and students. See which agencies are attending. Please arrive dressed for success and have multiple copies of your resume on hand. There will be on-the-spot interviews with some agencies. Good luck, and remember to smile! For more information, visit Fordham’s website. I knew I wanted to become a helping professional since college. Being part of the solution to address human trafficking was the reason for me to pursue an MSW, because I wanted to gain direct practice, programming, and research skills. I was drawn to Columbia School of Social Work’s AGPP track, law minor, and cross-registration system, which allowed me to pursue classes at the School of International and Public Affairs (SIPA) and Mailman School of Public Health. At UNICEF, I used a lot of research and analytical skills, along with knowledge of case management and many social protection issues, to develop the capacity of social workers. In my current role, I use a lot of communication and coordination skills to work with external partners and internal staff. As a Peace Corps volunteer, I anticipate using my programming skills to implement a variety of projects. What advice do you have for students and fellow alumni seeking to work in the international development and humanitarian sector? Network with professionals in the field and learn about their professional trajectories, as well as the skills in demand in the sector. Take advantage of courses such as financial development, proposal development, and program evaluation. Pursue opportunities that allow you to build research skills. My last semester field placement at the Social Intervention Group at CSSW provided me with important research skills that I have applied to research-oriented positions and that which will continue to be useful in the future. Remain culturally humble and self-aware of your own privilege and power. This practice has allowed me to work effectively in multicultural and multilingual environments. Follow your passion, be persistent, and don’t be afraid to step out of your comfort zone! To learn more about Winnie’s background and experiences in the field or simply to connect, feel free to reach out to her via email at chu.w.winnie@gmail.com. Congratulations to Nabila El-Bassel, the Willma and Albert Musher Professor of Social Work, to the rank of University Professor, the highest academic honor. A tireless leader in the fields of global public health and social work, Professor El-Bassel has dedicated her career to improving the lives of people who have too often been overlooked or neglected. Her landmark scholarship focuses on behavioral and social sciences approaches to addressing substance use, HIV/AIDS, and interpersonal violence within marginalized communities. She is one of the nation’s foremost experts in these areas and a pioneer in designing sophisticated and innovative gender-based interventions, many of which the Centers for Disease Control and Prevention have identified as models and best practices, and which have revolutionized prevention and treatment of stigmatized conditions across the United States and the world. Currently, she is leading community and system-based research to address the opioid epidemic in New York State. Professor El-Bassel is the recipient of extensive funding from the National Institute on Drug Abuse (NIDA) and the National Institute of Mental Health (NIMH). She is a Principal Investigator on the NIMH HIV Intervention Science Training Program for Racial Ethnic Minority HIV Investigators and a Principal Investigator on the T32 NIH Training Program on HIV and Criminal Justice. And, she has served as a member of the National Advisory Council on Drug Abuse. We are proud that Professor El-Bassel calls Columbia her intellectual home. After completing a BSW at Tel Aviv University and an MSW at the School of Social Work and Social Welfare at the Hebrew University of Jerusalem, she earned her PhD at the Columbia School of Social Work and continued her training here as a Research Associate in the Center for Social Policy and Practice in the Workplace and as a Research Associate and Research Scholar in the Social Intervention Group, before becoming its Director. She is also Director of Columbia’s Global Health Research Center of Central Asia, the core activities of which are outcome-driven and designed to improve the health and well-being of vulnerable populations in the region. A University Professor appointment is a rare and distinguished honor among our faculty. Not only does it signify scholarly merit of the highest caliber, it also designates the recipient as a professor of the entire University who can teach across schools and departments. Professor El-Bassel has devoted her career to the pursuit of knowledge and innovation that can strengthen communities and improve the human condition. She has established social work as a recognized profession in countries where it previously did not exist and has mentored generations of new researchers in a field that has had a transformative effect on the lives of at-risk populations. She richly deserves this honor—please join me in congratulating her. In partnership with the NYC Mayor’s Office for People with Disabilities, the Office of Career Services at Mailman School of Public Health is organizing an NYC: ATWORK Information Session on Thursday, April 25, 11:30 am – 12:30pm at Hammer Health Sciences Building – Room LL204, 701 West 168th Street, New York, NY 10032. NYC: ATWORK is the first public-private partnership creating career pathways for New Yorkers with Disabilities. Attend this event to learn more about the program and resources they offer. To request accommodations, please contact Edmund Asiedu at eea2137@cumc.columbia.edu. 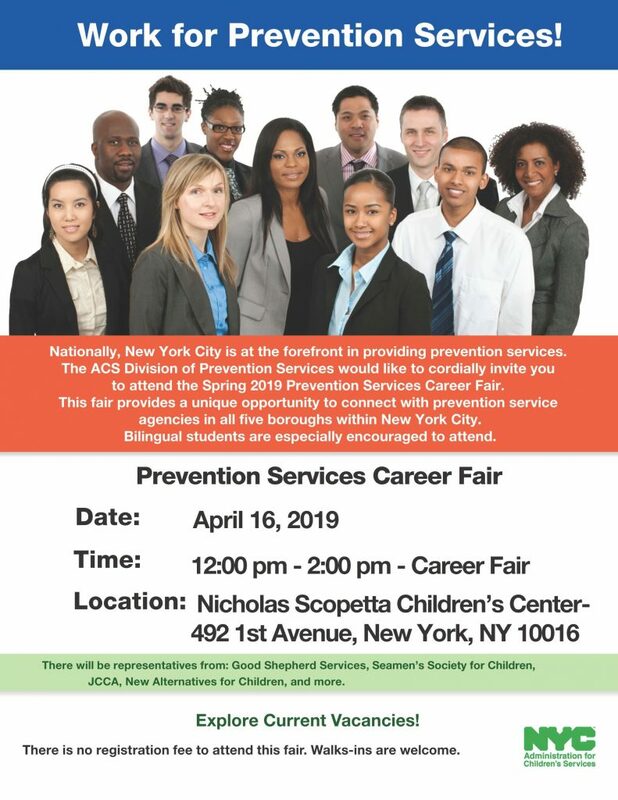 The ACS Division of Prevention Services invites graduating BSW and MSW students to meet with representatives from prevention service agencies servicing all five boroughs within New York City. Employers include Good Shepherd Services, Seamen’s Society for Children, JCCA, New Alternatives for Children, and more. Bilingual students are especially encouraged to attend. Nationally, New York City is at the forefront in providing prevention programs to support families. ACS has steadily increased the availability of prevention programs to include evidence-based models that are shown to improve overall child and family well-being. Thousands of families are receiving intensive counseling services tailored to their needs. Services such as parenting coaching, helps parents cope with the pressures they face to raise healthy children. Are you inspired by the possibility of working for the United Nations? 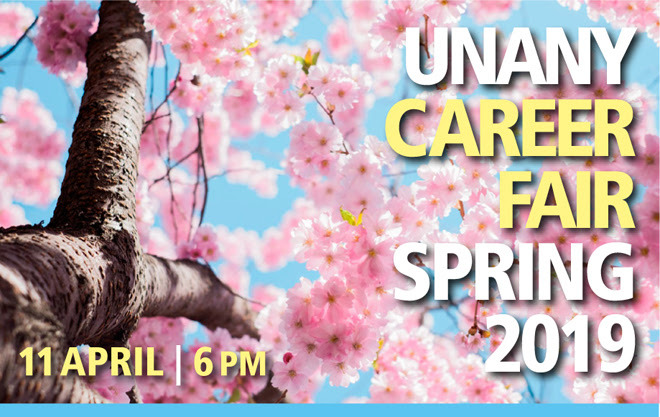 UNA-NY’s Spring Career Fair will provide an employment scope of several UN agencies — UN Volunteers, UN Women, UNDP, UNFPA, and UNICEF — courtesy of select personnel who will be presenting an overview of these respective organizations as part of the outreach this event will highlight. Areas covering human resources will be featured in the topics discussed among the panelists, who will speak to attendees about various types of positions available at these UN agencies, and discuss possible career paths with interested participants. Eva Jansen, a UN Human Resources Officer from the talent outreach unit, will also be on hand as moderator of the panel. All are invited to bring their resumes to the event, and attendees with some professional work experience are also welcome. Since the United States is under-represented at the UN, U.S. nationals are especially welcome to attend this event. Take advantage of this special opportunity to meet and speak with their guest panelists, who will provide valuable advice while sharing their experience. For more details, visit our event page here. For more information, go to their event page.